Do you know the answers to these questions about your customers? What is their greatest dream in life? What upsets them or makes them happy? What are their values and fears? The foundation of marketing is the process of identifying, meeting, and satisfying customer wants and needs. In order to meet their needs you must have a true understanding of your customers, their emotional triggers and what drives them. Personalization is critical. Customers expect it. It increases click-throughs, open rates, conversions, retention, and ultimately revenue. But how do you “do” personalization? It’s different at every step of the customer journey — and there’s a lot that goes into it. There are more channels and devices to reach customers than ever. The data, content, and delivery mechanisms necessary to personalize messages vary for each of them. That’s why we’ve been surveying you, our readers, to understand what you’re doing and how you’re doing it. Each of these identifiers, and others, can have dozens or hundreds of data points associated with them. Preliminary findings indicate that “known” identifiers (including email and other personally identifiable information, or PII) are used most. But anonymous identifiers like cookies and IP address — used more for advertising and acquisition at the top of the funnel — aren’t far behind. Email is the most important identifier, and also the most important channel. 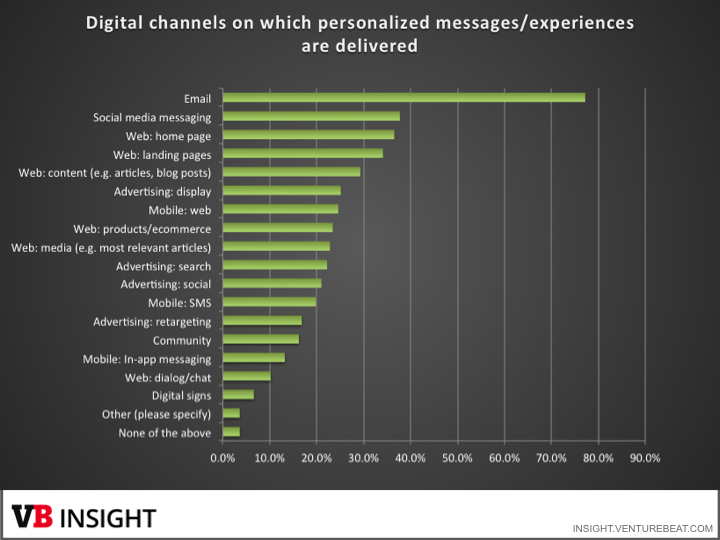 In fact, when it comes to delivering personalized messages, email dominates. The majority of marketers are doing some kind of email personalization, even if it’s just to use a dynamic tag with a person’s name in the subject or header. 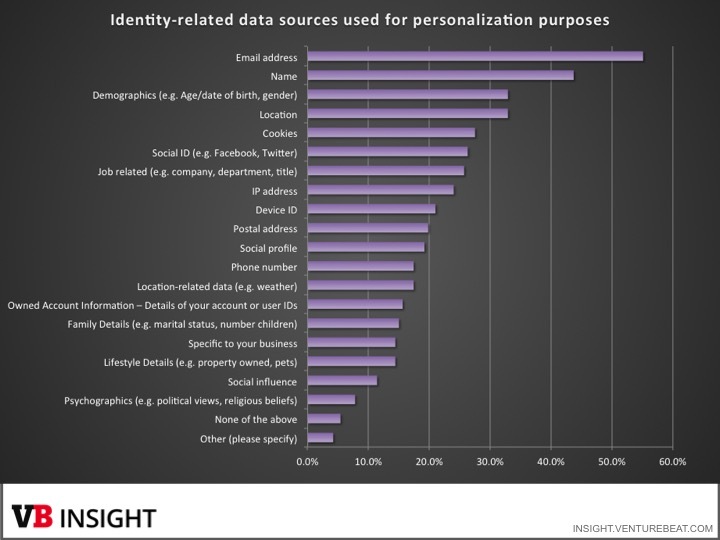 Website personalization holds several of the top spots as well. Advertising is surprisingly low, given the advanced targeting capabilities of many of today’s ad networks and demand-side platforms (DSPs). The evolution of search puts Google’s latest algorithm into perspective—the internet is expanding and the need for ranking is crucial. And businesses need to go mobile fast, or they risk losing out. A great place to start with your mobile marketing is responsive design for your website. Responsive design is a modern approach to design that ensures your content is readable and consumable on any device, such as your desktop computer, tablet, or mobile phone. Search Engine Preferred: Google simply prefers responsive design. This is evidenced on the various search engine algorithm iterations over time, and particularly in this most recent change. Responsive design makes it easier for Google to crawl, index, and organize your site. Cost and Time Effective: Instead of creating multiple websites for various device sizes, with responsive design, you only have to create one. Conversion Optimization: By designing your website to be responsive, you have control over how your conversion elements look on each device. Engaging User Experience: With responsive design you can create a consistent and engaging experience across channels and devices. Check out our latest infographic to learn about Google’s search evolution into mobile, what responsive design is and means for your business, and why you should get started designing for mobile right away! And to learn more information about mobile marketing strategy, be sure to download our latest and greatest Definitive Guide: The Definitive Guide to Mobile Marketing. Most social marketers have a strong sense of what kind of traction their content gets on each social channel. They’ll also probably be able to tell you how those metrics compare to the brand’s main competitors. This is the type of information that marketers obsess over, since it helps them determine the successes and failures of a social marketing strategy and benchmark their campaigns. These are important metrics to understand, of course, but they’re hardly the only social insights that should matter to a brand marketer. The real value of social data is what it can reveal about your audience. What do they care about? What inspires them? What do they do on the weekends? What TV shows do they watch? Why do they choose to buy specific products? Social channels offer a goldmine of information about audiences’ affinities — information that can help marketers improve any aspect of a marketing campaign. One particular area where audience insights can make a tremendous difference is social media advertising. Social ad buying is a game of inches, so every piece of information about a target audience is an asset in the competition for customers. Any additional data related to the market just makes it easier for the social ad buyer to identify new areas on which to focus to gain new fans and followers. But the challenge for brands is how to best uncover their audiences’ niche interests in order to identify the hyper-specific keywords that can turn prospects into customers and strangers into fans. That’s where social media monitoring comes in. While there are many existing methods of keyword discovery, few brands are tapping into the power of audience affinity data from social channels to shape their ad-buying campaigns. Those that are have seen powerful results. Our company’s client, Socialtyze, was tasked with promoting a film release, and as part of that effort, attracting more fans to the movie’s Facebook page. In order to inform the Facebook ad-buying strategy, Socialtyze turned to the conversation on Twitter to monitor the interests of users who were already tweeting about the movie. This approach pointed the Socialtyze team to a number of topics and interests they could use to shape the ad-buying strategy. For example, Socialtyze saw that those who had demonstrated an interest in the movie were 18 times more likely than the rest of Twitter users to be interested in the TV show “The X Factor.” It then used that intelligence to select keywords for Facebook buys. Choosing keywords based on audience affinities, Socialtyze found that social ad-buying campaigns were targeted more effectively and had a greater appeal to the audience it wanted to reach. Keywords derived from this strategy, including the “X Factor,” resulted in a 16 percent higher click-through rate (CTR) than keywords that were selected with other campaign analysis tools. Tying the interest-based keyword into the social ad-buying strategy resulted in a campaign that outperformed Facebook Audience Insights’ own suggestions by 31 percent in terms of the CTR. It’s been more than 25 years since the term “Lean Production” was coined, although the Toyota Production System is much older than that. Hospitals and health systems have been using Lean as an improvement methodology and management system for more than ten years. It’s also been about five years since the “Lean Startup” methodology was codified by Eric Ries. What makes Lean applicable in so many different settings (including banks, law firms, government offices, and non profits)? It’s not necessarily the specific tools – it’s the thinking, the mindsets, and philosophies of Lean. Now, Lean isn’t all about thinking. The actions taken and methods used are the result of the underlying thought processes and beliefs. Many organizations have been tripped up by thinking, unfortunately, that Lean is just about some tools or tactics that you implement. I learned these mindsets during the first decade of my career in manufacturing. In the second decade of my career, I’ve seen how powerful these ideas are in healthcare. And, I’d propose they would be helpful to any “Lean Startup” in their early stages or as they grow into a larger company. These are by no means the only 10 mindsets that matter, but here are some that seem most relevant to me, listed below in no particular order. I think the Toyota notion of “Respect for People” is deeply embedded in all of this. I’d love to hear your thoughts or your explanation of additional Lean mindsets in the comments. Lean thinkers realize that value is defined by the customer. What problems do we solve for our customers? Toyota had a chief engineer drive minivans across North America to better understand the needs of customers here (which illustrates a related concept of “go and see” or “genchi genbutsu”). Lean health systems redesign cancer treatment so everything and everybody comes to the patient, rather than making a fatigued patient walk from building to building. Lean Startups excel at understanding customer needs and value through the “customer development” approach. If you’re not sure where to start in your Lean journey, start with something that makes life better for your customers. As organizations grow, silos are created for functional areas – it happens in manufacturing companies, health systems, and larger software companies. It’s unusual for a single isolated function or department to deliver value to a customer. Lean teaches us how to break down silos through our use of methods like Value Stream Mapping. But, if we don’t have the mindset of breaking down barriers to collaboration, which includes looking at budgets and incentives, the mapping might just be a waste of time. Dr. Bob Wachter’s recent book The Digital Doctor includes a cautionary tale about how technology solves some problems, but hides or causes others. I think the headline of this excerpt unfairly blames the technology – it’s also a human factors and psychology challenge. Teaming Up Social Media with Email Marketing to Establish Your Online Presence. Social media and email marketing are two of the most popular online marketing techniques. They are very different, but that should not stop you from using them together to get more out of both. Email is a highly effective marketing tool, and your email list can become an essential marketing asset as you grow it. Social media provides a different way to communicate with your audience, and you can use it to enhance your brand image and grow your reputation. Rather than just focusing on one or the other, however, here are some ideas for integrating your social media and email marketing to give both of them a boost. One of the simplest ways to integrate your email and social media marketing is to use clear social icons in your emails. Put them right at the top of each email so that they cannot be missed, and you may even want to remind your email subscribers to share the email. Another option is to send emails reminding your subscribers about your social media networks and that they can benefit from signing up to follow you. Provide them with some great reasons to follow you, and you could give your number of friends or followers a boost. Social media can be an effective way to get more people to sign up to receive your emails. There are different ways that you can do this, but they all essentially involve tempting your followers to sign up by providing them with something of value in return for an email address. On Twitter, this is easy to do. Simply go to Twitter Ads and click on ‘Creatives.’ From here, you can create a lead generation card, and once you have created your card, you can encourage people to sign up to your emails without ever having to leave Twitter. You can also do this on Facebook, but in a slightly different way. The best option on this site is to use the Call to Action button to easily send people to a specific landing page on your website where they can then sign up to your email list. Getting lots of shares for your updates and content is one of the most important activities on social media, and if you hire a specialist like Simple Is Good Inc, this is one of the things that they may work on improving. If you are having trouble with your shares, you can really give them a boost by using your email subscribers. One of the best ways to supercharge your shares is to get social media users with the most influence to share your content. However, they are unlikely to do this unless your content has already generated enough social proof to demonstrate that it really does provide value. You could therefore write to your email subscribers asking them to share your content. If enough of them do so, this can help to increase your shares, which can help you get more influencers to share it as well, and this can take your number of shares to the next level. Retargeting is a popular form of advertising on social networks, but you can get even more from it when you make use of your email subscribers. Simply send out an email that contains an action such as visiting a certain page on your site, and you can then track those who act on the email. These are likely to be the people who will react best to your retargeting ads, so you can focus on targeting just them rather than anyone else. Nearly 50% of marketers score a grade of C or lower for their ability to prove Marketing’s value, impact, and contribution to the organization, according to our 2015 Marketing Performance Management (MPM) benchmark study: A Diagnosis and Prescription for Marketing Performance Management. But it’s not the grade itself that matters so much. It’s that marketers with lower grades exert less influence on decisions and have less credibility in the organization. Becoming an “A” marketer is not an easy task, however. First, you must be able to step back and figure out what corrective actions need to be taken. This article will explain why nearly 50% of marketers are receiving a low grade and what actions they need to take if they are to improve their own and Marketing’s performance, credibility, and influence. Most marketers feel the pressure. They know that their credibility and influence are at risk when they cannot connect marketing investments and activities to business results. Despite such awareness, they have yet to take the plunge—to dive into making the necessary effort. A sense of paralysis: The effort seems so daunting they don’t even know where to start, so they don’t start at all. A heavy current workload: Their plates are so full with activities and responsibilities that the thought of taking on more things is overwhelming. A lack of confidence: The work that needs to be done is outside their comfort zone. Those are not surprising themes; they often accompany situations requiring change. So what can you do to overcome them? The first two are a result of what is sometimes referred to as Paralyzed Productivity, which stems from a feeling of being overwhelmed. When people feel overwhelmed, they tend to over-complete things, or to delay in fear of doing something incorrectly or imperfectly. I sense this situation may resonate with some of you vis-à-vis marketing accountability. Realize that the simplest solution is probably the best. People who study workload paralysis suggest honing in on two of these tips to make headway: take a small step—a little momentum is better than none—and focus. Even a small step can give you a sense of accomplishment. If this situation reflects your current state, the first step is to make a plan. Let me guess what your small business online marketing strategy involves. In three words: blog, Facebook and Twitter. Now there’s nothing wrong with that. In fact, if you had any sense that is exactly what your online marketing strategy should look like. If you play your cards right, this may be all you’ll ever need to effectively promote your small business online. But is that all there is to online marketing? Of course not. Social media has been great for promoting business using the Internet, but there are other options that can also give excellent results. It would help your small business to explore how these alternative online marketing platforms can augment your current initiatives. The list here is absolutely just a drop in the bucket, but it can help you get started without having to get overwhelmed by all the options out there. To read the rest, www.dnb.com. Just an awesome article about how data and technology are changing sports and sports ticketing for the better. During the second annual Stanford Graduate School of Business Sports Innovation Conference, leaders from all corners of the sports world gathered to share their insights on pushing the boundaries of the industry. From building winning traditions on the backbone of technology to harnessing the dynamics between fan and franchise, teams must have a thirst for innovation to compete — both on the field and in people’s hearts — in the 21st century. Here are a few of the trends that are shaping the future of sports, today. But the team behind STRIVR Labs, a product of Stanford’s Virtual Human Interaction Lab, may have cracked the code. Its technology could revolutionize how quarterbacks, in particular, can hone their decision-making skills and speed up their reaction times — and without having to drag the full team onto the practice field. It comes down to what’s known in the field of VR as “presence,” the psychological phenomenon of feeling like you’re actually inside the simulation. Such realism is made possible by filming actual players and events on the football field, rather than relying on 3-D modeling or video-game effects. The result is immersive enough that, for the athletes who have used it, “as far as their brain is concerned, they’re actually running a play,” Shaw said. Over the past decade, one thing has become increasingly clear: Sports teams can no longer expect to just get the best players and win. As more organizations dedicate resources to the quantitative side of sports, from advanced statistical analysis and predictive modeling to the booming field of tracking performance with biometric devices, the playing field has leveled. The new competitive advantage won’t come to the teams that are capable of gathering the most data. It’ll go to the teams that can quickly and efficiently make sense of it all. We have too many coaches spending too much time in spreadsheets, collating data. Mark Verstegen, founder and president of EXOS, which designs training programs, added that even an organization outfitted with the most cutting-edge technologies won’t benefit much if it’s not built to act upon the very data it’s gathering. Teams need to have a “supply-chain management of human performance” — people in positions to make coordinated efforts to help athletes sleep better, eat better, move better, reduce injury, and improve performance based on what trainers, nutritionists, therapists, and other specialists find in the data. “That’s where the big gaps are,” he said. Brian Kopp, Catapult Sports’ president of North America, estimated that only 5% of pro and college athletes are using some sort of biomechanical devices, and even then it’s almost entirely in training, as most leagues are only beginning to consider allowing them on the field during games. But if you look at the most successful teams in any sport, he said, you’ll find the ones that are the most aggressive in their adoption of advanced training and tracking technologies. And anyone leading an organization that isn’t doing something in this area won’t have a job soon. “They’ll be replaced by someone who gets it,” Kopp said. Still, questions emerge around the proliferation of biometric technologies. Getting players, especially older ones, to buy in is one challenge. Kopp said the key is showing them that, rather than quantifying how their skills might be deteriorating, performance data will help them to extend their career and maximize their earning potential. “Once you do that, they’re usually very enthusiastic about it,” he said. Another issue is the question of who owns the data — the player, the team, or the technology manufacturer? Also, what limitations need to be put in place? “We sometimes forget that athletes are human,” Heal said. Just because teams pay athletes millions of dollars, does that give them the right to know what players are doing in their off time? “There’s a person living inside that body,” Verstegen said.